Jason and his little brother Darius were born into the dope game. After being left to fend for themselves on the streets, they met George, a high level heroin supplier. Darius goes on to become D-Boy – one of the biggest dope dealers on the East Coast. When he finds out who George really is, he realizes there is only one way out of this game. Joey Pinkney: Where did you get the inspiration to write American D-Boy? 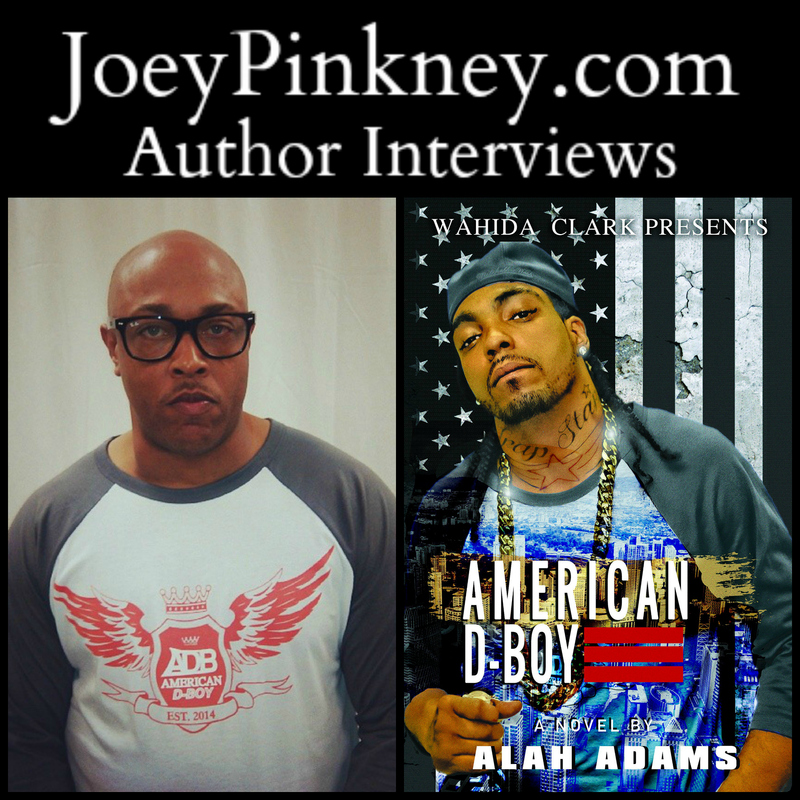 Alah Adams: I got the inspiration to write American D-Boy from the real Rick Ross story and Hip Hop in general. I dedicated it to the late great Jam Master Jay, one of my favorite DJs. The characters were based on people that I know, so they influenced the development of those characters. I also got inspiration from the corrupt government of the United Snakes Of America. JP: What sets American D-Boy apart from other books in the same genre? AA: The unpredictable twist and turns makes American D-Boy unique. You’re going to think it’s a book about Black men in the ghetto selling heroin. But that’s the veil, when you that take off you’ll see that it’s really about how the government systematically floods Black communities with tons of heroin from Afghanistan – which America just happen to occupy. Since we’ve been there, Afghanistan produces 85% of the worlds opiates. American D-Boy is going to bring up some touchy subjects that I hope will stimulate conversation. This book will cover things like the Prison Industrial Complex that is directly connected to the drug trade ran by the CIA, DEA, and all the other alphabet boys. JP: As an author, what are the keys to your success that lead to American D-Boy getting out to the public? AA: Grinding! I did 7 years in New York State Prison for selling narcotics. In that time, I wrote 7 novels. Upon my release, I self-published my first novel Banana Pudding. It got me in the door at Nikki Turner Presents Publishing. I kept grinding, and I landed a deal with the Queen – Wahida Clark. JP: As an author, what is your writing process? How long did it take you to start and finish American D-Boy? AA: I come up with the story in my mind first. Most of the time, it’s a good title or something that I feel is incredibly interesting. I usually work on a strict time schedule. I try to bang out 2,500 to 5,000 words a day when it’s crunch time. It usually takes me 180 days from start to finish. JP: What’s next for Alah Adams? AA: I’m currently writing a book for the legendary God MC Rakim Allah. It’s called How to MC. I have a pending deal for a book I just started called Thot. Three chapters of Thot will be at the back of American D-Boy. I want readers to let me know what they think. Hopefully, I can land a movie deal for American D-Boy. Nice interview, I had the pleasure of meeting author in Atlanta at First Read Expo, I know this going to be a wonderful read,the brother is an awesome person to talk to and listen to his views, and hear about his other books.